Wolfram Alpha is a smart, computational take on the search engine, but its new partnership with Microsoft and its Bing search engine is even smarter. Gradually, Bing is rolling out Wolfram Alpha integration for searches related to health and nutrition. Need to know the fat content of your lunch, or your own body? 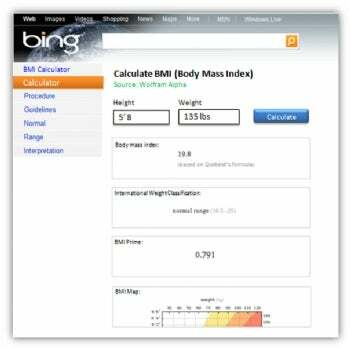 When you search in Bing for, say, "Body Mass Index," a BMI calculator powered by Wolfram Alpha will appear atop the results. It's a neat feature that provides more ammunition in Microsoft's war against Google, but the bigger beneficiary is Wolfram Alpha, and by proxy, curious Web searchers. On its own, Wolfram Alpha can be disappointing, because you never know if the so-called "computational knowledge engine" will spit back the results you're looking for. Wolfram Alpha interprets your search as query for specific information, and draws on terabytes of hand-picked facts to get the answer. But finding what you want, in my experience, is a crap shoot. For instance, I can't get Wolfram Alpha to tell me, or even estimate, how many fish are in the ocean. Searching for "number of fish in the ocean" returns an estimate of total ocean fish biomass, measured in metric tons, and a follow up search for "ocean fish quantity" returned no results at all. I encounter similar problems every time I revisit the engine to see how it's holding up. The point is, you don't know what Wolfram Alpha knows, which makes the product unreliable. That problem is solved when Bing uses Wolfram Alpha's application programming interface for search results, because you're restricted to a very specific topic--in this case, health and nutrition--in which Wolfram Alpha excels. Wolfram Alpha should be doing more of these partnerships. Nutrition is just a fraction of what the engine knows, and it'd be cool to see more of its vast knowledge appear in Web searches. It's not clear whether the partnership with Bing is exclusive in any way, but Microsoft shouldn't drop the ball on gobbling up more of what Wolfram Alpha can do.